Protect Your Fortress - The Chip's Challenge Wiki - The Chip's Challenge Database that anyone can edit! Shield your fortress with blocks, gliders, and fireballs to divert the five bugs into the bombs! 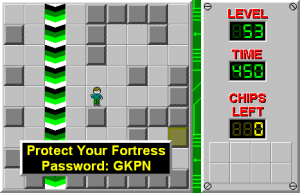 Protect Your Fortress is the 53rd level in Chip's Challenge Level Pack 4. It was created by Tyler Sontag. The goal of this level is to load 24 blocks, gliders and fireballs onto the force floor which divides the main portion of the level in half. Start by loading the blocks in the bottom half of the level onto the force floor and work your way upward. Make sure to alternate sides of the force floor as you work upward, otherwise you might block yourself from loading lower blocks onto the force floor. 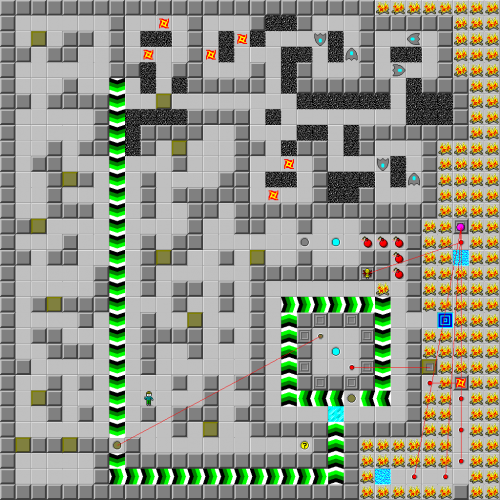 All blocks are required, except for the block closest to the bottom left corner of the map, which must be pushed into the corner to access a nearby block. When you reach the gravel portion of the level at the top, use the last available block to redirect all the fireballs and gliders onto the force floor. Only one block is needed to do this - simply push the block into the path of each cluster of monsters so that they can exit and they will find their way to the force floor. Once you have freed all the monsters, push the block into the last remaining space on the force floor. Now enter the recessed wall on the right side of the level and go through the teleport. Stand on the brown button long enough for all the items on the force floors to form a full wall around you, then press the red button once, cloning five bugs. Go back through the teleport and wait for the bugs to destroy all five bombs, then proceed to the exit. Although it is intended to load a total of 24 objects onto the slide, it is possible to only load 23 objects due to the ice tile at the bottom of the area.